Worldwide smart connected devices (SCD) are forecast to grow 15.6 percent year over year in 2014, reaching close to 1.8 billion devices, according to the latest global market study by International Data Corporation (IDC). 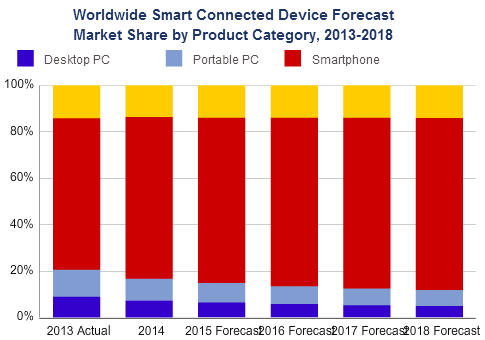 Smartphone growth is expected to lead the upside market potential, as PC and tablet (plus 2-in-1 device) forecasts have been lowered in light of a weak first quarter of 2014. By 2018, IDC now estimates shipments will grow to 2.4 billion units. "Apple's iOS-ification of Mac OS, and Microsoft's implementation of Modern UI throughout different form factors are clear indicators that we're living in a mobile-first world," said Jitesh Ubrani, research analyst at IDC. In future, the PC will become the new accessory to mobile devices, as smartphones become the first and primary computing device for many people around the world. IDC expects smartphone shipments to outpace total PC shipments by more than 6 to 1 in 2018. The smartphone installed base is quickly approaching two billion units, and vendors are scrambling to find the next two billion users in new markets. As such, IDC is forecasting strong double-digit growth in the low-cost Android smartphone segment that is driving much of the growth in emerging countries such as China, India, and Brazil. Meanwhile, mature markets such as the United States and Western Europe are slowing to single-digit growth rates as the installed base swells to reach absolute saturation. In contrast, IDC believes that low-cost Android smartphones will drive much of the SCD shipment growth in coming years. These devices will enable the mobile-first world marketplace. The influx of inexpensive phones will drive the SCD average selling price bands downward, with the sub-$200 band increasing from 33 percent of total shipments in 2013 to greater than 43 percent in 2018. Also, devices that cost more than $500 are forecast to shrink from 33 percent of total device shipments to 21.1 percent.